The U-Haul Company of Pennsylvania and Miguel Rivera, a general manager of U-Haul's Hunting Park location, were charged Tuesday with violating hazardous materials regulations in connection to the deadly blast. Nearly four years after a Philadelphia food truck explosion killed a woman and her daughter, a Pennsylvania U-Haul company and an employee face charges. The six-count indictment accuses Rivera and the U-Haul company of violating the United States Department of Transportation regulations on classifying, handling and packaging hazardous materials. Rivera filled two propane cylinders back on June 29, 2014, according to the indictment. On July 1, 2015, one of those cylinders ignited and exploded in the back of the La Parrillada Chapina food truck as it sat parked along Wyoming Avenue in the Feltonville section of Philadelphia. 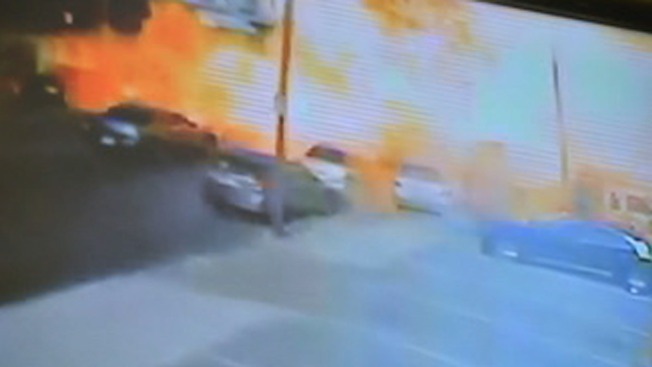 The explosion engulfed the entire street in a fireball and sent shrapnel flying some 95 feet. The blast injured Olga Galdernez, 42, and her daughter, Jaylin Landaverry, 17. Both victims died from their injuries weeks later. Nine other people were also hurt. Rivera faces 15 years in prison while the U-Haul Company of Pennsylvania faces a maximum sentence of five years of probation if convicted. A lawsuit filed on behalf of the family in June of 2015 said the tanks were aging and damaged and should never have been refilled by staff at U-Haul. U-Haul's parent company, Americo, both stores' general managers and food truck kitchen designer ERI Vending Cart were named in the suit as well. "This was a bad tank that should not have been filled," attorney Alan Feldman told NBC10. "There are specific federal regulations that companies like U-Haul have to observe." The tanks, which were owned by Galdernez, held 100-pounds of propane each. She had them regularly refilled by friends at two U-Haul locations along W. Allegheny Avenue and W. Hunting Park Avenue, according to the suit. Feldman said she, like many others, would not know how to spot a bad propane tank. U-Haul staff are required to inspect the tanks, make sure they're in good condition and ensure the valve design is current. Those checks were not done, the suit alleges. "This was by all accounts an old tank," Feldman said. "This was not a leak, this was a rupture of the entire tank." In the explosion's wake, Philadelphia City Council began pushing to change state law to allow local inspections of food truck propane tanks. Olga Galdemez, 42, and her 17-year-old daughter, Jaylin Landaverry, pictured two years ago at the girl's quinceanera.